Dangers increase for drivers in the period between Christmas Eve and New Year’s Day. There is more traffic on the road, drivers are often growing accustomed again to operating in the snow and many people are drinking and driving. These factors often lead to an increase in motor vehicle accidents. The driver and all passengers should wear seat belts. Carry the phone number for a cab company. Call them beforehand to ask any questions so you are not reluctant to call them later. Consider taking public transportation, such as a bus or subway if available. Stop drinking a few hours before you plan to leave. Stay where you are until you are sober enough to drive. Travel slow. More drivers and pedestrians may be on the roads for the holidays. If possible, familiarize yourself with your driving route during daylight hours and before the holiday. Parents should limit the driving of teenagers on the holidays to avoid car accidents. Offer both alcoholic and non-alcoholic beverages. Have a cab company’s phone number ready. 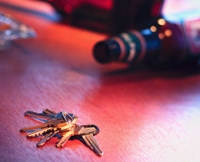 In Massachusetts, you have a legal responsibility to make sure your guests do not leave your home under the influence. If you are hosting a party and serving alcohol, learn about the Massachusetts social host liability law. The Massachusetts car accident lawyers at Breakstone, White & Gluck of Boston represent individuals who have suffered serious personal injuries or wrongful death in Massachusetts motor vehicle accidents. We handle cases throughout the state, from Boston and Cambridge to Worcester to Springfield and Cape Cod. If you have been injured, contact us today for a free legal consultation at 800-379-1244 or 617-723-7676 or use our contact form.